The Piazza del Popolo was built in a neoclassical style from 1811 to 1822 and was designed by Giuseppe Valadier. It is a large oval area that is located in Rome, Italy. In English, the name means “square of the people.” There are three churches that border the area, and there is also an ancient Egyptian obelisk which honors Ramesses II. The north side has the beautiful Porta del Popolo, and this takes visitors to the Via Flaminia. This structure was constructed in 220 BC in order to connect Rome to the Adriatic coast. Many travellers entered Rome using the Via Flaminia, which passed through the Piazza del Popolo. Pope Pius IV, in 1562, commissioned the architect Nanni di Baccio Bigio to build a very large gate called the Porta Flaminia. This was built to make an impression on the pilgrims that entered the city. When Sweden’s Queen Christian visited Rome, in 1655, the interior of the gate had been elaborately decorated by Bernini. Later, the name of the gate was changed to Porta del Popolo. 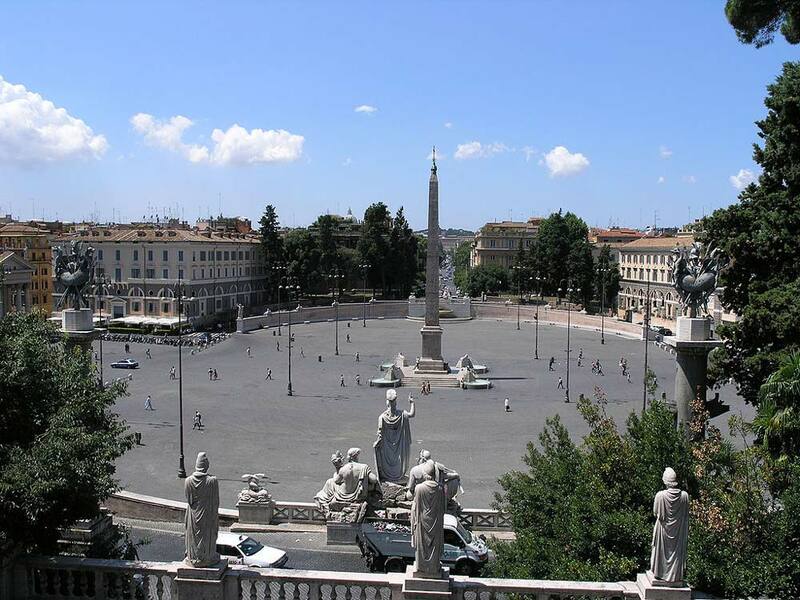 Pope Sixtus V, in 1589, had an obelisk from Egypt relocated to the main area of the Piazza del Popolo from the Circus Maximus. The obelisk is 73 feet tall and was built around 1300 BC. It stood in the Sun Temple area of Heliopolis. Roman Emperor Augustus had the obelisk moved to Rome in 10 BC. It was then put up to honor the Roman Empire’s conquest of Egypt. Giuseppe Valadier, from 1815 to 1816, remodeled the square. He had walls built to surround the square, which gave the piazza its oval shape. A central fountain was also added, along with the addition of four Egyptian lions that were put around the Egyptian obelisk. The square’s walls are decorated with sphinx statues that are designed by Giovanni Ceccarini, an Italian sculpture. One fountain that is located on the west side of the square is called the Neptune Fountain or Fontana del Nettuno. It depicts Neptune with his triton and two dolphins. The Fontana della Dea di Roma is opposite of the Neptune Fountain, and is located at bottom area of the Pincio Gardens. The central figure in the fountain is known as the Goddess of Rome, and is located between two allegorical figures that represent the Tiber and Aniene rivers. Within the southern area of the Piazza del Popolo there exists two somewhat symmetrical churches. In 1658, Pope Alexander VII had the two churches built, the Santa Maria in Montesanto, and the Santa Maria dei Miracoli. These two churches are not exactly symmetrical because the plot of land for the Santa Maria was smaller. The Santa Maria del Popolo church is also located in the square, and was constructed 1472. It actually replaced an eleventh century chapel. This church features many impressive artworks such as the oldest known stained-glass windows in Rome, along with works of art from Caravaggio. There are two famous chapels, the Della Rovere which has fifteenth century frescoes, and the Chigi which was designed by Raphael.